Games are starting to implement their own battle royale modes, at all sorts of scales. Last week, Red Dead Online introduced its own battle royale-lite mode, entitled Gun Rush. 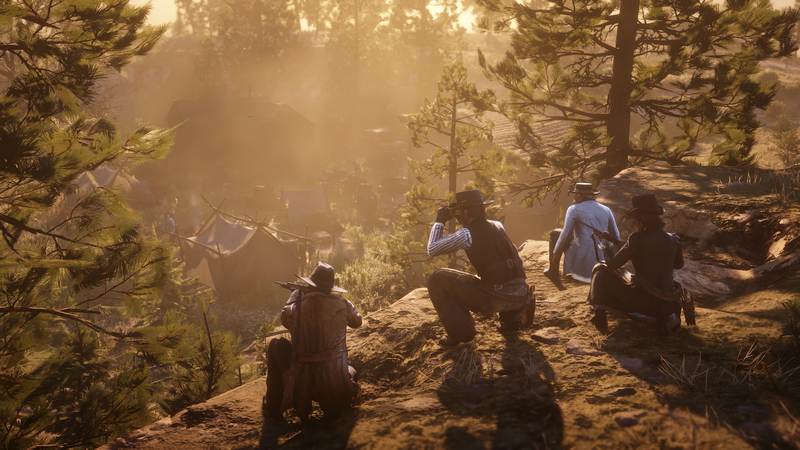 It's really the second battle royale-ish mode to come to Red Dead Redemption 2's online counterpart, but Gun Rush's sights are set more clearly. It's a battle royale mode in everything but player count and name. For anyone who plays the likes of Fortnite or PlayerUnknown's Battlegrounds, Gun Rush's frame work is a familiar concept. In Gun Rush, only 32 players are in a fight to the death until the last person standing. As players scrounge for guns and ammo across the map, a circle closes in. But it has major problems: the spawns are a bit odd, and the experience you net for the time played simply isn't worth it for its already sparse progression—unless you always land at the top spot. Of course, the most successful "supplemental" modes to come of the battle royale trend are obvious. There's Fortnite, once just a colorful PvE zombie game, now known more for its free-to-play battle royale spinoff mode, and then there's Call of Duty: Black Ops 4's Blackout. The success of both comes from the player count and sizes of their maps: Fortnite supports 100 players, while Blackout supports a crisp 88. The missing 12 doesn't end up feeling like it matters much, due to Blackout's fast-pace. Blackout's Call of Duty-like formula and Fortnite's identity reinvention are the big success stories in established games trying their hand at a new genre trend. If only other games could be so lucky. Across the past almost-two years, we've seen quite a few battle royale modes grace the likes of Steam and consoles, but largely, they're standalone releases like PUBG. But enough time has passed that now we're seeing the opposite end of things. H1Z1, in one of the earliest examples, divorced itself from its survival half in 2016. Eventually, the battle royale mode's King of the Kill name was dropped, and it lay firm claim to "H1Z1" proper—somewhat like Fortnite's embrace of just "Fortnite" by most fans, rather than its full name of Fortnite Battle Royale. In the past couple months, more battle royale modes have cropped up in online games. At its beta launch, Red Dead Online had Make It Count, wherein players only had bows and knives at their disposal within a shrinking circle. In January it's introduced Gun Rush, a similar mode, only with more weapon options. Last month, Counter-Strike: Global Offensive went free-to-play, and introduced a new battle royale mode, Danger Zone, alongside its standard multiplayer fare. Standalone releases too, like the ill-fated S.O.S., sometimes bill themselves as battle royale when their player counts barely stretch over 30 usually. In March, Battlefield 5 will unleash its own entry in the battle royale race with Firestorm, a mode we know will have 64 players total, leaning on Battlefield's strengths of working alongside a squad. Also instead of a strange wall of death, it's an actual ring of fire that is closing in. Yikes! Still, that player count pales in comparison to Call of Duty's own battle royale mode, which is admittedly more traditional compared to Battlefield 5 Firestorm, which will be bringing tanks and other intimidating vehicles into the mix. Firestorm sounds at least interesting as a concept compared to other battle royale games. And for a battle royale to stand out, it really needs an extra hook to make it greater than just another Last Man Standing. I have an issue with other games trying out "battle royale" modes that dial back the scale considerably. In order to be a battle royale, that tension is necessary, be it from an astounding player count or an unforgiving locale like the usual isolated islands in the middle of nowhere. There are interesting ideas in some battle royale-lite modes, like in Red Dead Online's stealth-dependent Make It Count, but largely, they just feel like afterthoughts. That said, it's easy to see how the now well-storied battle royale mode is appealing. Epic Games shifted its early-access zombie game into an overnight sensation; Call of Duty's own foray into the mix combines the best of Fortnite and PUBG, with its own dash of what makes the Black Ops series so appealing. It remains to be seen if Battlefield 5 will enjoy the same level of success that Blackout has, given its smaller scale. At least Battlefield 5 seems to be doing something right though: taking the formula of battle royales and bending it into its own unique mix of gameplay. If only Red Dead Online, CS: GO, and whatever other battle royale modes out there that will someday be (or already are and I'm forgetting) could embrace the same sensibility. Tagged with Battle Royale,	Opinions,	PlayerUnknown's Battlegrounds (PUBG),	Red Dead Online,	Rockstar Games.